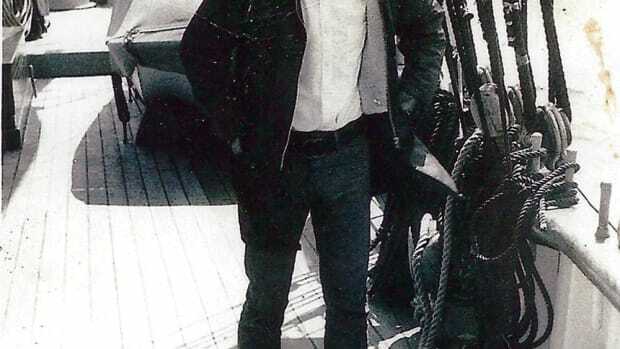 A young boy&apos;s imagination ran wild sailing the Caribbean aboard the Caribee. 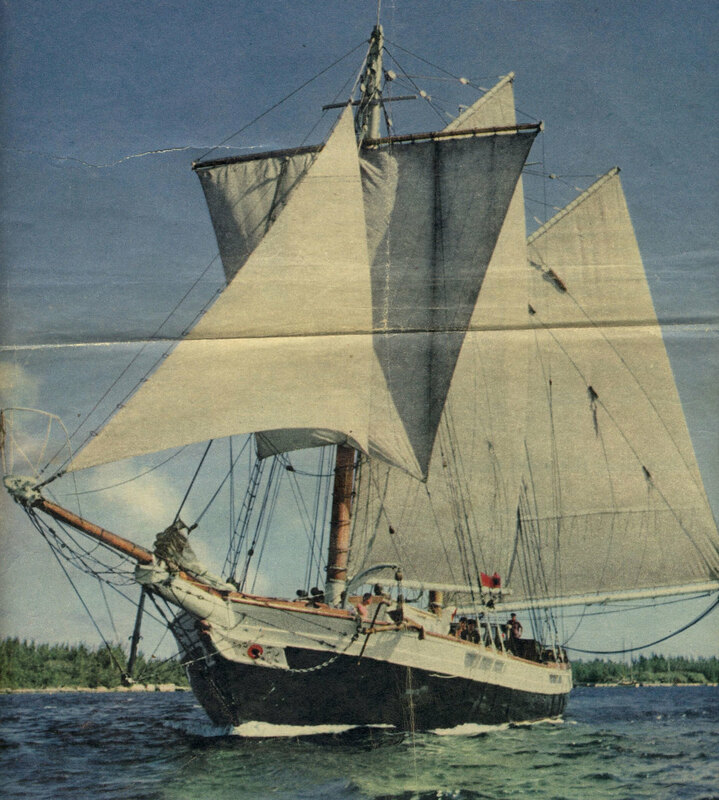 Ship’s log: May 19, 1958, privateer Caribee. Dropped the anchor in 5 fathoms off Treasure Point, Norman Island — the real Treasure Island. As the dolphins swam beneath the bow, they looked up at a little boy lying in the bowsprit net. His whistling and waving excited them, and they replied with clicks and beeps. The two species knew there was a fleeting moment of understanding. The ship altered course to starboard, northeast of Jost Van Dyke, the island named after the Dutch pirate. A full-size replica of the famous Baltimore clippers, the ship had tall, raked spars that were square-rigged on the foremast, and her long, sleek black hull sported a row of gun ports along the deck line. 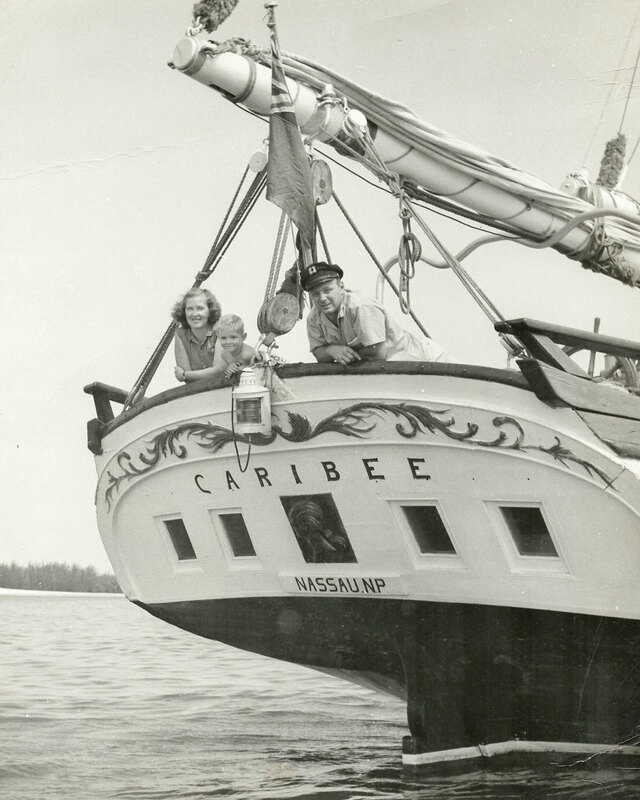 The name Caribee was emblazoned across her broad transom, and below it was the golden bust of a Creole woman and her port of hail: Nassau, New Providence. With sails trimmed taut, she sailed fast, leaving a long white wake behind her. 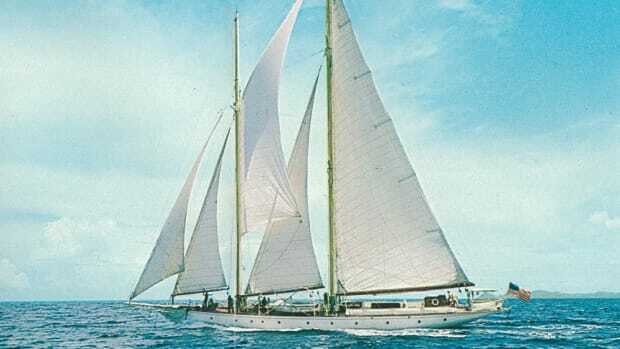 Closing on the islands, Caribee left the swells of the North Atlantic astern and coasted into the calmer waters of the BVI. 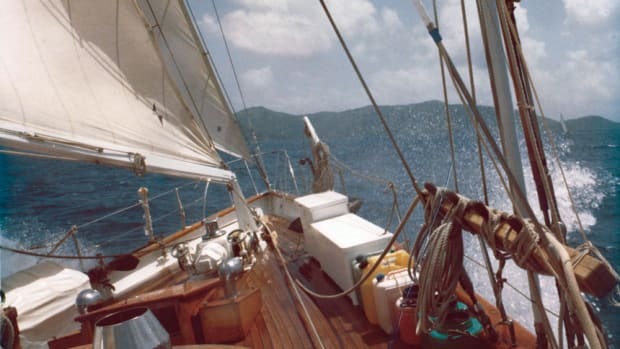 The skipper, aware of the treacherous shallows surrounding him, kept well west of Anegada, avoiding the reefs surrounding that island. 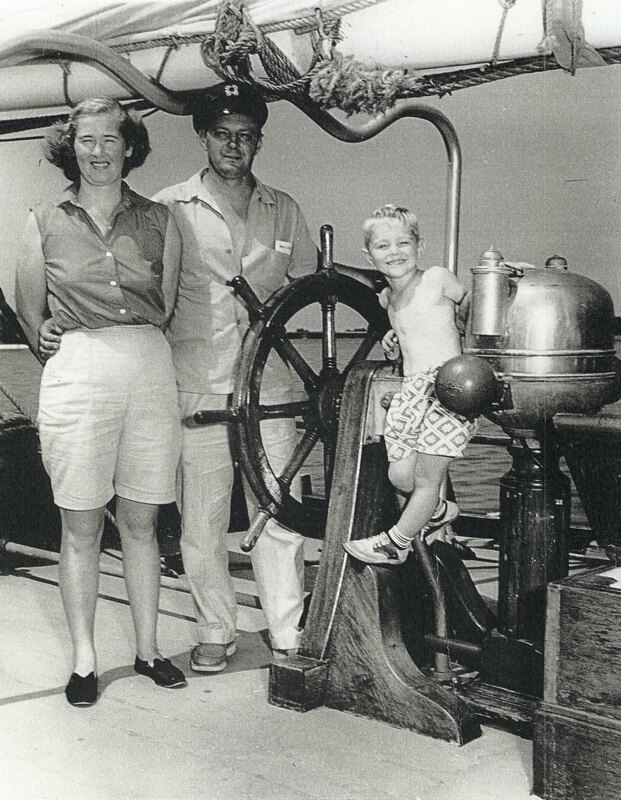 The author with his mother and father aboard Caribee. 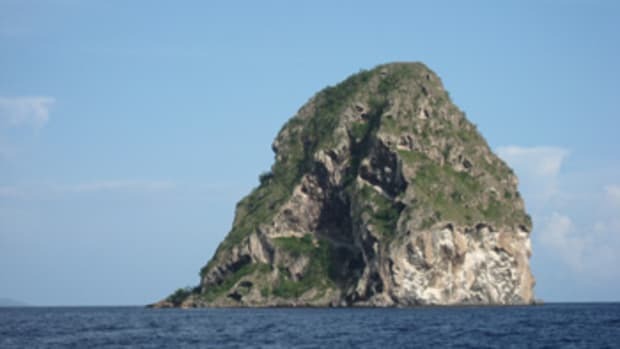 As the vessel came onto a more southerly course to enter Sir Francis Drake Channel, the crew trimmed sail and, sailing southwest, passed the small, rocky Dead Chest Island, then Deadman’s Bay to the south. This was the cay of fifteen men on a dead man’s chest — yo, ho, ho and a bottle of rum. 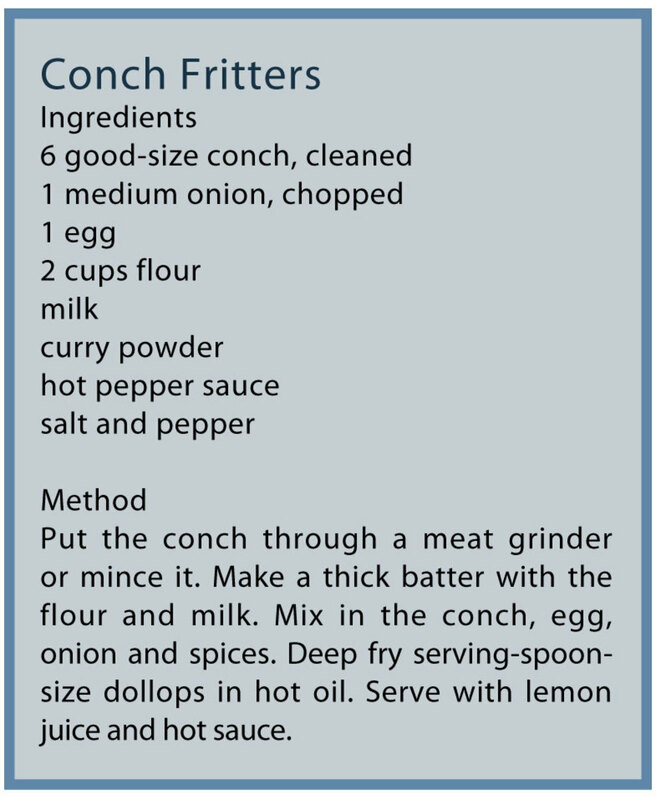 The crew of the Caribee returned to an era when pirates frequented these waters. In a time long past, there were cutlasses, pistols and death on this very cay. As the sun climbed higher, the Caribee approached Norman Island, and the captain spun the wheel, bringing the ship into the wind under Ringdove Rock. The crew lowered the sails, and the anchor was made ready. 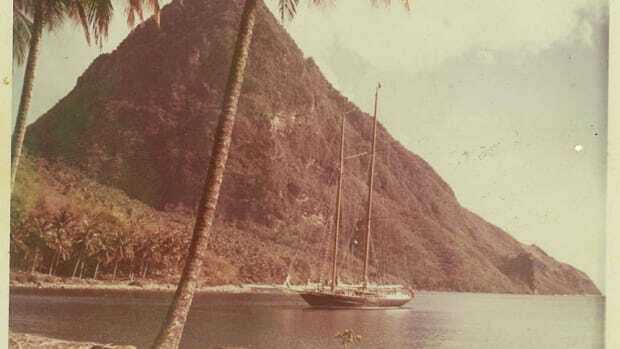 Caribee slowly came to a halt in a calm cove in 6 fathoms, and the words “let go” echoed off the surrounding cliffs as the captain ordered the anchor dropped. The rattle of rusty chain riding over the wildcat marred the quiet, and the schooner’s mate watched the big fisherman anchor sink to the bottom, where it could be seen lying on its side in the sand. The small cove was shaped like a horseshoe, sheltered by two rocky bluffs. The beach was white sand with pebbly sections, and the land behind it rose steeply into a thickly wooded ravine. 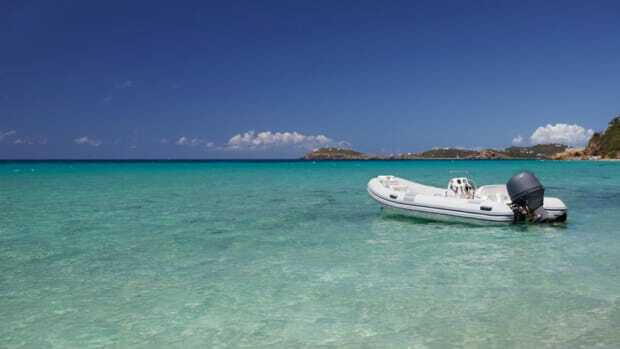 According to legend, Norman is the island that inspired Robert Louis Stevenson’s Treasure Island. The family aboard the Caribee had left their native Canada and sailed to this area to begin a life in the windjammer trade. During the previous month, the 35-yearold captain had sat in the aft cabin, reading to his son from an old copy of Treasure Island. The setting was perfect: an authentic privateer sailing ship manned by West Indians, the brass cannon on the afterdeck and now a visit to Treasure Island. For the young boy, the story was very real. He had his treasure map, with skull and crossbones, and the treasure’s location. Once the ship was squared away, the crew swung out the longboat and lowered it to the water. 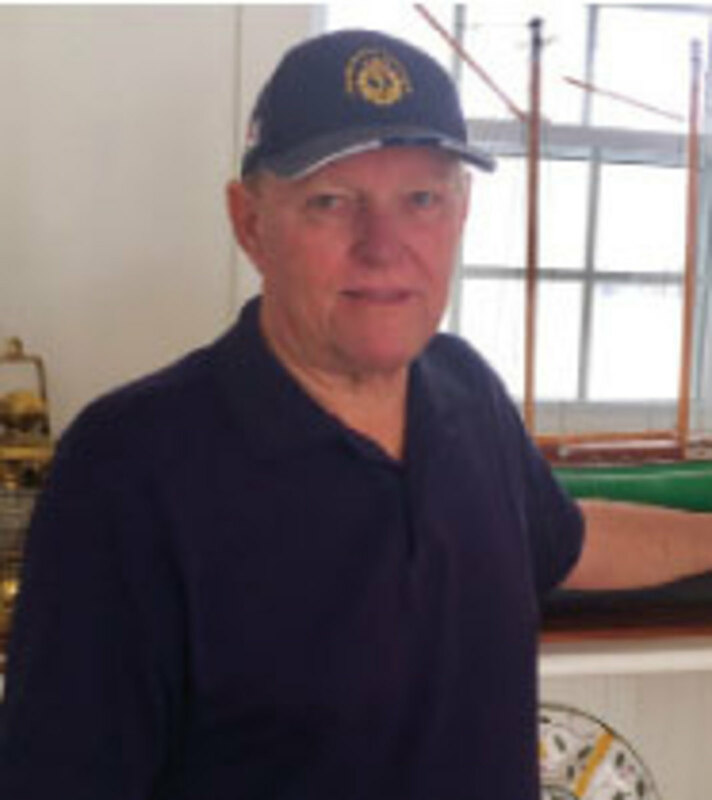 The captain called his son to the starboard rail and pointed ashore. “Now, according to the map, the treasure must be near the end of the beach, just by those rocks,” he said. The boy’s gaze followed his father’s arm toward the north end of the beach, where there was a pile of loose rocks and a few boulders. “Do you really think so, Daddy?” he asked excitedly. “Oh, yes. See, the map says so,” the captain replied, pointing to a black spot on the map. The boy could hardly keep still, fidgeting as he stood waiting in the gangway, watching the crew load the oars and rudder into the longboat. After a few minutes, the mate shouted that all was ready. Two deckhands pulled for shore, oars bending to the task. The captain handled the tiller, and the boy crouched below the gunwales. As the bow grounded gently on the sand, the crew shipped the oars, and the father and son stepped ashore. “Now, I’ll wait here while you go and find the treasure,” the captain said. The boy looked toward the loose pile of rocks to the north, then nervously began walking down the beach. He was uneasy, with visions of Ben Gunn, cutlasses and Long John Silver swirling in his mind. He gripped the treasure map so hard his knuckles turned white. Reaching the end of the beach, the boy searched around driftwood and boulders, jumping back with a start as a hermit crab lumbered away. He glanced over his shoulder for the familiar figure of his father. So fevered was his hunt that he almost missed what he had come to find. In a sandy spot below an outcrop of reddish-brown stone, behind a rock half-buried in the white sand, was an old brass-bound chest — about a foot long and half as high, heavy and weathered with scorch marks. Kneeling, the boy struggled to pry it out of the sand. With hands shaking, he struggled with the rusty latch to expose the contents to the brilliant sunlight. His breath came in rasps as he ran his hands through the glittering pile of jewels, rings and coins from across the Caribbean. A pirate’s treasure for sure! The captain heard his son’s shrieks of joy and smiled quietly. “I found it! I found the treasure, Dad!” the boy screamed as he bounded down the beach, the chest raised for all to see. Suddenly there was a loud report from the trees above the beach. A wild-looking character with a red bandana and a pistol in his hand sprung from the woods. Oh no! Ben Gunn is coming to take back his treasure, thought the young boy. Clutching the chest, his heart pounding, the boy sprinted the last few hundred feet toward his father and crew, who were holding the longboat ready in the shallows. His little feet furiously kicked up puffs of sand. “Let’s go quickly boys, that’s Ben Gunn up there!” the captain shouted as the boy dove into the boat and they pushed off from shore. The pirate fired another shot as they pulled away from the beach. The boy placed the chest carefully on the floorboards and begged the two deckhands to row as fast as they could. The longboat swiftly closed the distance between shore and the Caribee, and once aboard, the captain opened the waist-high gun port facing the beach. With the help of the bosun and the gun tackles, he rolled out the brass cannon. “Fire!” the captain shouted, and the bosun touched a match to the cannon’s wick. The boom cracked and echoed around the cliffs and hills of Treasure Island. As the smoke cleared, the crew watched as the pirate fled into the safety of the woods. Later that evening, the family sat around the big mahogany table in the Caribee’s aft cabin. 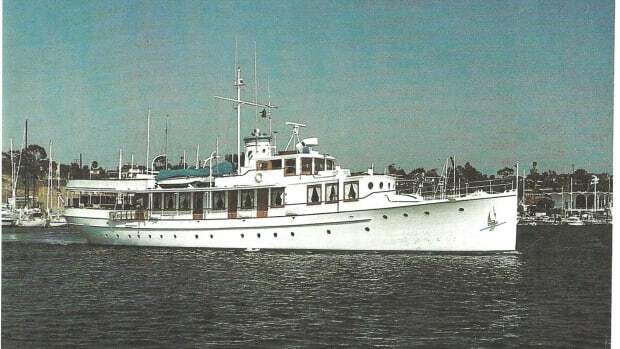 The light from the overhead brass lamp glittered on the water beneath the stern as it shone through big aft windows. As was deemed fair, all of the crew shared in the booty; the boy carefully doled out the treasure. A penny here, a guilder there. The fo’c’sle crew were called one by one to the aft cabin, where, after being sworn to secrecy, each was given his or her rightful share. The boy was left with a fine collection of coins and jewelry, and though not a king’s ransom, it was true and real treasure. During the months that followed, the copper became shiny again as he counted the coins over and over and returned them to the brassbound chest. 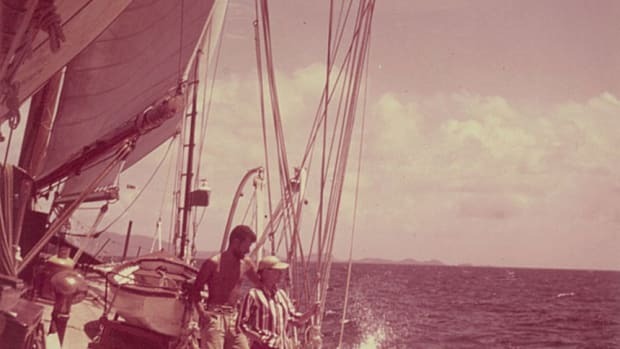 That boy was me, Robert Louis Boudreau, and the Caribee was my father’s fourth windjammer schooner in the 1950s. She was a Howard Chapelle design that W.A. Robinson built at his yard in Ipswich, Massachusetts. 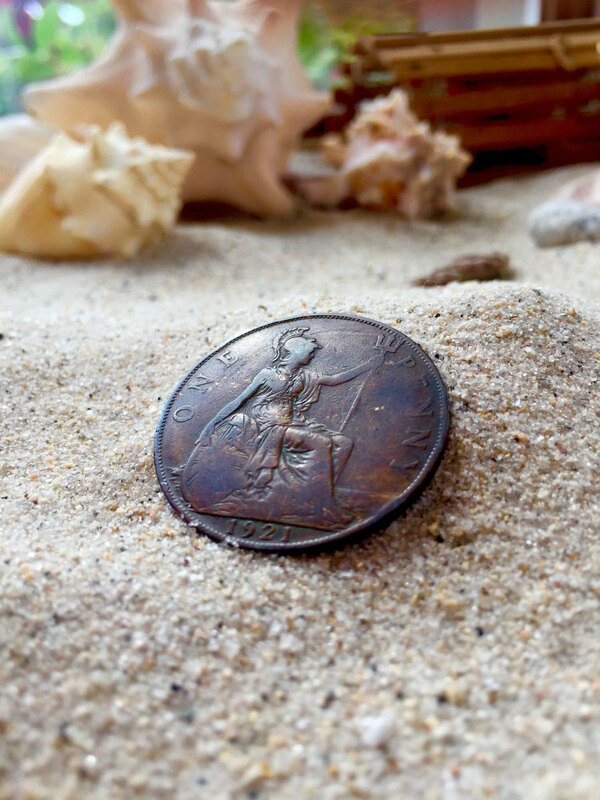 More than 50 years later, all that’s left of my treasure is a single copper British penny. Sometimes, as I sit by the fire on a cold winter evening, I hold it in my hand. The copper grows warm, and as I close my eyes I see the open quarterdeck of the Caribee and the brass cannon. I hear the creaking of the block and tackle. I see my treasure chest in the sand, and I feel the terror of Ben Gunn emerging from the trees. The buccaneers and pirates of long ago stashed their loot in the oddest places.